I love a good shot of coffee. But just one, as I’m too aware of what’s going on behind the scenes. Caffeine’s effects on the ‘happy hormone’ dopamine is what concerns me – well, concerns me on the one hand – but also drives me towards that morning shot. Yes, caffeine is addictive. This substance is able to increase dopamine levels using the same mechanism as heroin and cocaine; by slowing down the reabsorption of dopamine thereby leaving more plentiful amounts in the brain. The effect, clearly, is much weaker than that of heroin (or Trainspotting would have been a PG, shot in Starbucks and a whole lot tamer). Similarly, it is the dopamine-manipulator caffeine in chocolate which makes it so difficult to give up. Some of the trickiest conversations I have had within clinic have involved chocolate withdrawal. Whipping away the caffeine without replacement is unwise. In my practice we consider the desire for caffeine on a deeper level. Why the need for a dopamine lift and how to achieve this in softer more self-caring way. Unquestionably a shot of caffeine injects adrenaline into the system to give you a quick legal high. You feel good, if but temporarily, then the down initiates another requirement for a caffeine hit and here we have the vicious cycle. The question is – how do we break this? Step one – go slowly. Cut out the coffee which you least require and replace with a more soothing hit. I’m working on substitutes this week in preparation for a week-long juice fast at Amchara Health Retreat in Gozo. My top creation of the week, with the aim of speeding up the metabolism in a similar but more therapeutic way, is the Coconut Matcha Latte. The ingredients involve some superfoods which have the potential to lift mood, increase thermogenesis and add an anti-ageing angle too. It is the EGCG catechins in Matcha tea which give it the extraordinary health benefits. It is reported that, based on research done by the University of Colorado in 2003, Matcha has 137 times the antioxidant value of ordinary green teas. So incredible for immune boosting and much kinder to your skin than a caffeine hit. 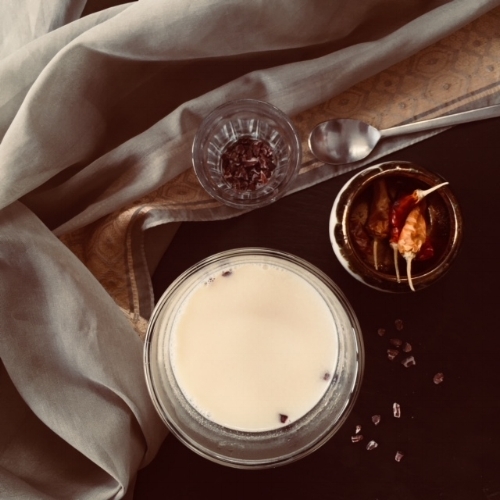 In a milk pan, gently heat the tea-bag in the coconut milk, add the chilli and cacao nibs. Brew until the milk turns a delicate green, sieve the tea and sip. A sweet, satisfying and visually pleasing drink without the highs and lows of a traditional latte.